Description: Mt. Nacolod is a very high priority key biodiversity area (KBA). It is a prime location for the region’s flora and fauna, being home to more than half of Leyte's known plant species. It harbors 134 birds, 111 herpetofauna species, and almost all known mammal species recorded in this area. A recent survey of this KBA also brought new discoveries: three species of volant mammals, cinnamon, and two new frog species of the Platymantis family. However, the conservation of Mt. Nacolod is still challenged by illegal collection and poaching of wildlife, conversion to agricultural use, and conflicting land tenurialship, among others. Bio-geographic features A declared forest reserve, one of two Key Biodiversity Areas (KBA) identified in Mt. Nacolod is partly situated in Southern Leyte Province. Vegetation in the area is mainly composed of regenerating second to old growth forest and patches of cultivated area in forest edges. Mt. Nacolod is home to a diverse set of birds (41 of which are endemic to the Philippines, 14 endemic to the Visayas and the Greater Mindanao faunal region); mammals (17 species [or 47%] are Philippine endemics of which 8 are restricted only to the Mindanao faunal region). 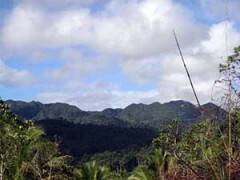 It is home to highly threatened endemic bird species such as the Philippine Cockatoo (Cacatua haematurupygia), the Visayas wattled-broadbill (Sarcophanops samarensis), and the forest specialist Walden’s hornbill, (Aceros waldenii). Other Matters of significance The most recent conservation efforts in the site were to demonstrate REDD+ in 2010 and to pilot new conservation approaches (NEWCAPP 2012), DENR-led efforts that had complements from staunch conservation supporters such as the GIZ, USAID, and the Foundation for the Philippine Environment, among others. The most important outcome of these efforts, apart from putting Southern Leyte in the conservation map globally with the discovery of the two new species of frogs (Platymantis spp. ), was the declaration of Mt. Nacolod by the provincial government of Southern Leyte as a Local Conservation Area (LCA - with resource allocations for its conservation and protection) triggered by the identification of at least six High Conservation Value Areas (HCVAs). The identified HCVAs came with a package of concrete management options that would assist in furthering these sites’ conservation. Two major watershed reserves have been established in Mt. Nacolod: the BUAC Watershed Reserve and the Hinabian-Lawigan Watershed Reservation. In terms of species richness, endemism and threatened species, more than half of the known plant species on Leyte Island have been recorded in Southern Leyte. More than half (133 out of 182) of the known species of birds can also been found. Eight new island records include the endemic and threatened (Vulnerable, IUCN Red List 2013) Little Slaty Flycathcher (Ficedula basilanica). Almost all of the know mammal species have been recorded. New island records include three species - Least Pipistrelle (Pipistrellus tenuis), Greater Bamboo Bat (Tylonycteris robustula) and the Lesser Tube-nosed Bat (Murina suilla). That study also found a total of 77 reptiles and 34 amphibians including the two newly discovered species of litter frogs (Platymantis spp.). Another interesting highlight was the discovery of the Cebu cinnamon (Cinnamomum cebuense) that was known only in Cebu Island. Building on the gains of the previous engagements in Mt. Nacolod, the project aims to complete profiling of High Conservation Value Areas (HCVAs) in Mt. Nacolod and Southern Leyte by verifying and gathering more baseline information; gather baseline information on unique key trigger species and major threats that would serve as a guide for proper conservation action; and create a social fence around Mt. Nacolod by assisting communities to act as a buffer against the entry of destructive activities from surrounding areas. PhP1,673,600 South Pacific Integrated Development Foundation, Inc.
2013 Mt. Nacolod Landscape Stakeholders' Analysis PhP97,350 VISCA Foundation for Agricultural and Rural Development, Inc.
2012 Resource and Socio-Economic Assessment of Mt. Nacolod Landscape PhP1,000,000 Mahintana Foundation, Inc.